Hark back to April 2016 when I wrote about Joshua Gray and his #Bard154 project. He compressed my 14-line Sonnets into 140-character quatrains, and posted all 154 of them to Twitter. Joshua has now expanded upon his contractions. His new book of poetry, The Life and Death of King Edward, was recently published. Even today it’s hard for me to type ‘King Edward’ without anticipating the bootsteps of Little Cecil’s guards, coming for me with halberds. The book numbers just 111 pages, but Joshua’s alchemy gives each one a high specific gravity. In his poetic alembic, my already-condensed metre and rhyme have been boiled off. What remains is the double-distilled essence of the story, as he sees it. The ‘Prince Tudor’ interpretation of the Sonnets is an issue of debate among Oxfordians, and is at times a contentious question. If you’ve seen the 2011 Roland Emmerich film Anonymous, it won’t be new to you. But you should find it no bar to enjoying this book, even if you don’t subscribe to the theory as Joshua does. Prince Tudor, in a nutshell: Variant 1 posits that Elizabeth and I had a son, who was brought up as Henry Wriothesley, 3rd Earl of Southampton. Variant 2 adds that Elizabeth was also my mother. It’s complicated. Don’t let it scare you off. The story, told in this book through blank verse using a variety of voices, can hold your interest no matter how factual or fantastical you believe the premise to be. Joshua owns his opinion and I remain reticent, but this review is ecumenical, up to a point. If your Bard wrote his sonnets as impersonal dramatic exercises, dozens and dozens of home-schooled homework problems to suss out a new verse form for maximum effect, then this is not your book. But in that case, welcome to my blog! I presume you arrived here by accident. The Life and Death of King Edward plays out in seven sections: prefatory Inductions, five Acts, and an Epitaph. There are background notes before each section, a few footnotes, and a handful of black-and-white illustrations. It’s well organised. You know you’re in for a ride when the first thing you read in the first section is young Princess Elizabeth dropping F-bombs. The book is not profane, but this is a significant beginning, meant to knock you slightly off balance. It does. Bess swore like a sailor when she wasn’t on display. She may have learned a few of her more nautical oaths from me. Cecil’s face would go beetroot under his beard, and I would try to stifle my laughter. Acts I through IV tell my story from the 1562 death of my father (the 16th Earl), through the Earl of Essex’s harebrained, disastrous rebellion in early 1601. The characters speak in first-person modern English, beneath titled headings. Sometimes it’s soliloquy, sometimes dialogue. In one instance the narrator himself breaks into the conversation. This is where you notice Joshua’s talent for distillation, bespeaking his years in Appalachia. The final line in the following excerpt made a lingering impression on me. No wonder. It is treason, you know. I find no treason in you. to stain a rope red. Act V contains the Sonnet quatrains, with minor tweaks from the earlier tweets. They’re divided into roughly chronological chapters, according to the structure that Hank Whittemore developed in his 2005 book The Monument. Mr Whittemore contributed the summaries that precede each of these chapters. Last time when I asked Joshua to select a sample, he chose #76 (that every word doth almost tell my name). This time, I’m picking one that highlights the unconventional interpretation. in the changing crown. It is ever-fixed. The line bears life eternal. If I’m wrong, I am no poet. You won’t find any of that in your copy of Booth. 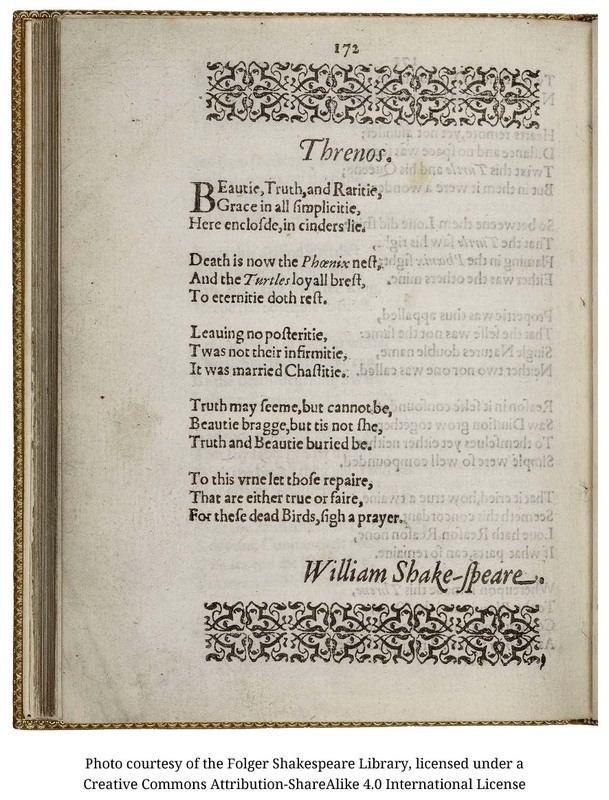 The Epitaph ends the book with the Threnos section from The Phoenix and Turtle, published in 1601 over the name of William Shake-speare. The Life and Death of King Edward can be read in a sitting or two. It’s short, powerful, and intense, like two fingers of neat whiskey. My alcoholic analogy is American, so it’s -ey. I admit that I’m partial to the metre and rhyme that were vaporised in Joshua’s second pass, but you can hardly blame me for that. When he first posted his tweets in 2016, we agreed that the quatrains served best as companions to the originals, not as replacements for them. In that light, they don’t lack a thing, and they add much. The Sonnets and the quatrains are two spirits made from the same mash. The first is potent, but with colour and depth gained through the passage of time. The second – new, perhaps illicit, and which not everyone chooses to drink, is the product of the second trip through the still: the white lightning. I can verify that the title of The Monument applies to the book itself as well as its subject. It’s quite an investigation. Posted on 28 September 2017 4 June 2018 by @edevere17Posted in Arts, Authorship (of Shakespeare), Literature/Writing, New Poetry By Others, Poems, Shakespeare, Sonnets (1-154)Tagged Biography, Book Review, Drinking, Elizabeth I, Hank Whittemore, Henry Wriothesley/3rd Earl of Southampton, Joshua Gray, Poetry, Prince Tudor theory, Sonnets (discussion of), Twitter.